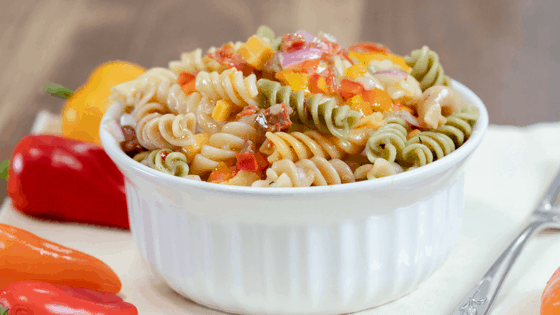 This recipe for Easy Italian Pasta Salad is not only simple but quick to make. I use veggie spirals in this recipe which gives the dish a boost of nutrition and makes it even more vibrant with color! This salad is a tasty and colorful addition to any potlucks or party. The colors are vibrant, therefore, this dish would look great added to any Summer spread. I would say the minimum time to refrigerate this before serving would be 2 hours. If you have time to make it ahead, I personally would aim to let it chill overnight. By letting it chill overnight in the refrigerator it gives Italian dressing a chance to mingle and soak into the pasta and veggies. This Easy Italian Pasta Salad is incredibly easy to double or even triple if you’re making if for a large crowd. The prep work is super easy – cook your noodles, dice your veggies and cheese, and add in your dressings and oil. So simple! It’s a great go-to recipe when you don’t have a lot of time to prepare a dish! Don’t miss a recipe – Follow me on Facebook and Pinterest! I’m also on Twitter and Instagram! If you like this recipe, check out my RECIPE page for more!! 1 package Veggie Spiral Pasta 12 oz. Drain pasta and add 1/4 cup of olive oil to prevent pasta from sticking together and drying out. After it cools, add in peppers, cheese, pepperoni, and onion. Mix in Italian salad dressing. Let it chill in refrigerator overnight for ultimate flavor! Love the pepperoni in your salad! This is perfect for a cookout! Nothing more easier than a pasta salad to tailgate with! This sounds right up my alley! You can’t beat a classic pasta salad. There are so many things that you can do with it. LOVE pasta salads this time of year! Love that this has pepperoni, a favorite of my kids! Pasta salads are one of my favorite summer sides! This one looks so fresh and flavorful! I can’t wait to try out the recipe, thanks! Beautiful colors. Such a nice and easy idea for summer pasta salad.